Halloween can be an exciting time for children, but not always safe for pets. Follow these tips to ensure your pet feels safe and secure. 1.) Keep pets away from candy! All forms of chocolate –especially baking or dark chocolate can be dangerous, even lethal, for dogs and cats. Symptoms of chocolate poisoning may include vomiting, diarrhea, rapid breathing, increased heart rate and seizures. Halloween candies containing the artificial sweetener xylitol can also be poisonous to dogs. Even small amounts of xylitol can cause a sudden drop in blood sugar and result in loss of coordination or seizures. 2.) Give pets a safe place to relax away from the door. Not only will your door be constantly opening and closing, but strangers will be dressed in unusual costumes and yelling loudly. This, of course, can be very scary for our furry friends. Dogs that are especially territorial may become anxious and behave unexpectedly showing aggression or growling toward trick-or-treaters. Giving your pet a peaceful place to relax away from the commotion that is secure will not only keep them calm, but prevent them from escaping from the front door. 3.) Don’t leave your pet in the yard unattended. As much as we hate to admit it, there may be some pranksters causing problems in the neighborhood. Don’t let your pet be the victim of teasing, injury or worse. Although these behaviors are not likely and are totally inexcusable, they can be easily prevented by keeping your pet safe with you. 4.) Keep Halloween plants such as pumpkins and corn out of reach. Although they are relatively nontoxic, such plants may result in gastrointestinal upset should your pet ingest them in large quantities. Intestinal blockage can even occur if large pieces are swallowed. 5.) Keep wires and electrical cords out of reach. If chewed, your pet could cut themselves on shards of glass or plastic, or receive a possible life-threatening electrical shock. 6.) Keep your outdoor cats inside several days before and several days after Halloween. Black cats especially are at risk from pranks and other cruelty-related incidents. In fact, most shelters do not adopt out black cats during the month of October as a safety precaution. Other cats that are used to being outside may get spooked from all the commotion in the neighborhood and find themselves further from home. 7.) Don’t dress your pet in a costume unless you know they will love it, and be safe to wear it. If you decide to dress your pet up, make sure the costume in not annoying or unsafe. It should not constrict movement, hearing, or the ability to breath, bark or meow. Although tempting it may not be the best idea to bring your pet out for trick-or-treating. 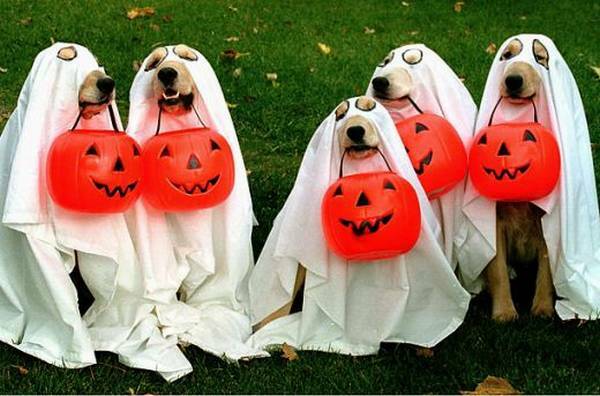 Even the best-trained dogs can get spooked or aggressive in the noise and confusion of Halloween. If you do decide to bring them, a piece of reflective tape will also help your pet be seen by passing cars in the darkness of the spooky night! 8.) IDs, Please! If your dog or cat should escape and become lost, having the proper identification will increase the chances that they be safely returned. If your pet is microchipped, you may still want to consider putting an obvious collar with tags as well. Just make sure the information is up to date. If your pet is microchipped, make sure it has been properly registered. 9.) Unhook your doorbell and leave a sign to please knock. The constant ringing may create stress in your pet that might not think of. If you have a peaceful space set up for your pet away from the noise, asking trick-or-treaters to knock instead of ring the bell will only help keep the calm. 10.) Avoid hazardous decorations such as flaming jack-o-lanterns and candles which can burn your pet. Avoid streamers or ribbons around your pet’s neck, on their collars or costumes or in your home. These items are frequently ingested and may cause intestinal obstruction which requires surgery to remove.